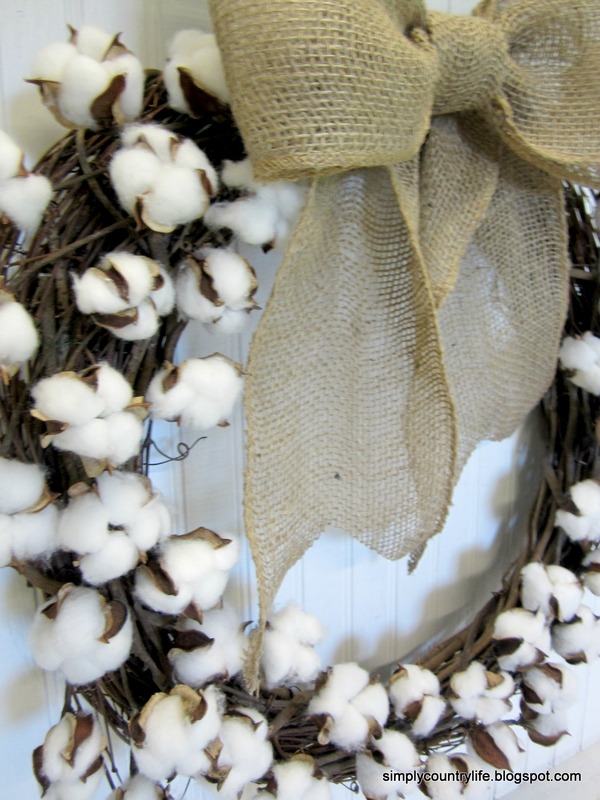 I'm in love with the cotton boll branches that you see often in home decor right now. Not to mention how pretty fields of cotton are. I decided to make a wreath using cotton for the Fall show I'm doing this Saturday. I purchased my supplies from Michaels. I started by cutting the cotton stems shorter with wire cutters. I attached the first stem to the top of the grapevine wreath with floral wire. I shaped the cotton branch a little and attached each branch in a few places with the wire. the third branch covered the stem of the second branch and the same for the fourth branch. Again, I attached each branch in a few places to hold them securely onto the wreath. To finish it off and keep with the natural, neutral, rustic look, I added a burlap bow. The bow is also attached with floral wire. 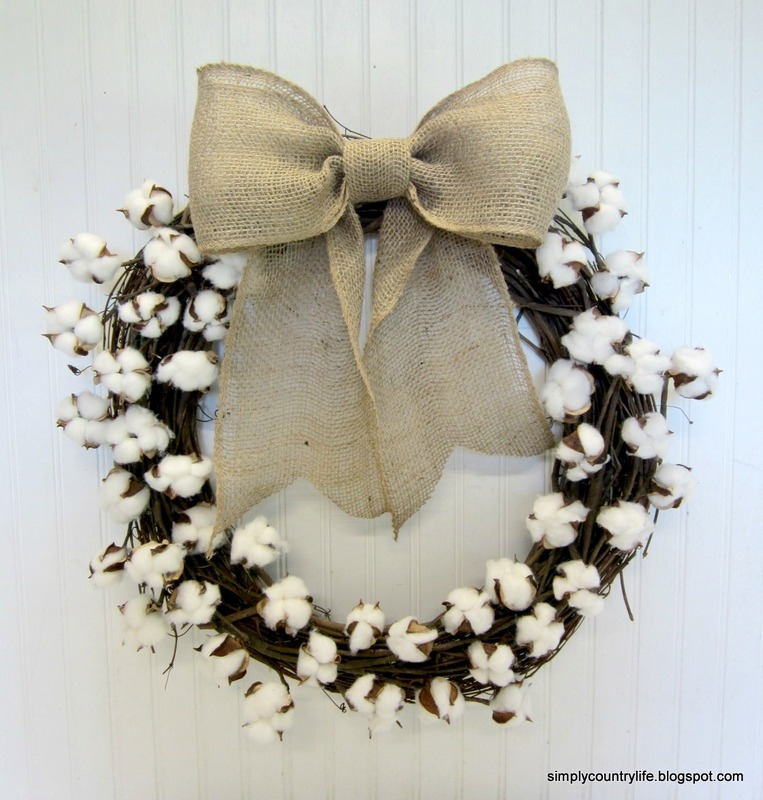 You can arrange the cotton bolls once the wreath is finished. I still remember the first time I drove past a field of cotton in Alabama. I actually pulled over so that I could touch it. Thanks Dawn! I hope your fall is starting off great! Thank you so much Sherri. I'm definitely loving the cotton! Love it. The wreath is perfect. This wreath is absolutely beautiful. It makes me think of home (Georgia). And you are not strange at all for stopping and touching the cotton! I used to LOVE driving out in the country and seeing all of the beautiful cotton fields. I so want to make this now! Thank you Ashlyn. By the way, I love your name. I'm looking forward to some drives through the country this fall. This is so lovely. I want to make one for my friend's birthday. Where did you get the faux cotton branches? LOL; I did the same thing driving down Interstate highway I5 in California through Bakersfield.... the next year later we pulled over so i could take a plant (while it was young only 1 foot tall) it grew for a little bit in my yard but then died....the next year i found a vendor to send me seeds to grow my own and they never took.....I wanted to do this to show my children back then when they were 7 and 10 how it looks....I am going to make this.... although i haven't seen those stems in Michaels but I'll be really looking now and maybe Hobby Lobby.... THANK YOU!! I thought about trying to grow my own cotton. Thanks for sharing your experience with it. I found the cotton branches at Michaels last fall, so perhaps they'll have some again this fall. You can find them online at www.saveoncrafts.com.